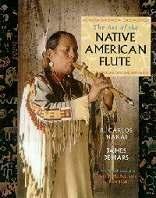 Oregon Flute Store Catalog > Flute Playing Resources > Learn to Play Books & DVDs > "The Art of the Native American Flute"
This book is a summation of R. Carlos Nakai's years as an educator, performer and student of the Native American flute. Part One includes discussions on tunings, fingerings, performance technique, tablature, style, history, standard notation, traditional ornaments plus a section on the care and maintenance of the flute. Part Two includes sixteen transcriptions of Nakai's songs plus two of DeMars' compositions. Part Three is an analysis of Nakai's role in Native American culture as a recording artist and performed by the eminent ethnomusicologist David P. McAllester. More than a performance guide, this book is an important source on the Native American flute and a concise review of the career and artistry of one of the most important ethnic artists in America. 132 pages.